The 802.11ac Wave 2 Wi-Fi standard promises a faster wireless future with more possibilities for higher education. There’s a new wireless standard in town, and it’s set to revolutionize what colleges can do with their networks and the speed at which students can burn through online media. Devices that are compatible with the 802.11ac Wave 2 standard are set to hit the market later this year, but access points for networks are already being upgraded the world over in preparation for the new generation. Cisco has spent months preparing college campuses for this transition. EdTech spoke with Prashanth Shenoy, senior director of enterprise networks at Cisco, to learn what this standard means for higher education. 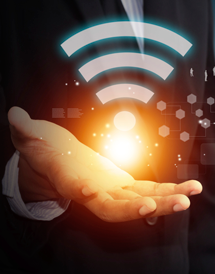 How to achieve a best-in-class wireless infrastructure with 802.11ac. Wave 2 of 802.11ac represents the fifth generation of wireless networking standards. Higher education institutions will immediately be able to take advantage of one of Wave 2's most significant new features: a huge upgrade to the capability of multiple input and multiple output (MIMO). "With multiuser MIMO, a single access point can talk to multiple clients simultaneously," Shenoy explains. Higher education institutions that adopt this latest standard will be able to more efficiently use the entire Wi-Fi spectrum. Devices that are Wave 2 compatible are more easily managed, which frees up bandwidth on a network to better serve devices using older standards like 802.11n, g and b. This multiuser capability will also enhance battery life for devices using Wave 2 networks. Because throughput is greater, users can get on and off the Wi-Fi networks at a faster rate. Shenoy projects that battery conservation for Wave 2 networks could jump two to three times beyond the current wireless standards. The enhanced throughput of 802.11ac Wave 2 will carry higher education networks into the future, where being able to shoulder the stress of mobility will become key to survival. While on campus, students and faculty members now carry multiple devices, which devour bandwidth on school networks. And then there’s the ever-expanding scope of online multimedia services being consumed. Mobile devices in particular are bandwidth-hungry because they digest so much streaming content, according to Shenoy. "That's a fundamental reason why we see a lot of our customers — specifically in education — looking toward the next-gen Wi-Fi standard," he says. One of the biggest selling points of Wave 2 is its enhanced speed. The newest standard has a projected transfer rate ceiling of up to 6 Gbps, more than doubling the throughput of Wave 1 and quadrupling the capabilities of 802.11n. That’s going to be an important factor in the near future, when connected devices will dominate networks, says Shenoy. The Internet of Things (IoT) is the next horizon for bandwidth stress. “There are a lot of things that will start adding to traffic. Together, the bandwidth requirement is expected to become exponential,” says Shenoy. “It’s not just the performance per device but the sheer number of devices on networks that will cause bandwidth requirements to skyrocket. “Both from a bandwidth perspective and a security perspective, it’s going to be interesting,” he adds. Making the leap to Wave 2 won’t be difficult for those with Wave 1-compatible access points. Cisco offers a module that helps convert the hardware to be compatible with Wave 2 at a much lower cost than entirely new hardware. Owners of hardware from previous generations, including 802.11n and lower, must invest in new Wave 2-ready access points and, potentially, infrastructure, including new Ethernet cables, to support Wave 2’s features.